When the Bulldozer and Fuso finally reached firmer ground, they stopped to disconnect. It was such a relief to finally have gotten the Fuso to a place when it is unlikely to drop through the playa. We all stopped and checked over the condition of the Fuso and assessed the situation. We stood around and talked for a while. Then it was on to the staging area to load up the bulldozer and mini excavator. You can see the Semi-truck and trailer in the distance to the left of the bulldozer. 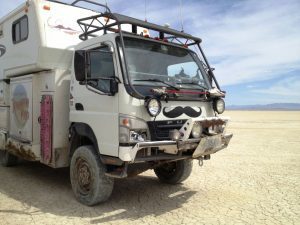 The Fuso drove on this part of the playa just fine. I took it easy and followed so that I could take pictures and watch the Fuso’s progress. Everyone made it to the staging area without any problems. Willie loaded up the bulldozer. Gary had not arrived yet. Willie was going to wait for Gary and they were going to pick up an unoccupied vehicle that had been stuck in the playa. Jon and I in the Fuso and Carman in his Xterra decided to go ahead and leave to playa. We were going to meet at Bruno’s Gas Station. We finally drove on the actual playa road, not just across the playa. It was very dusty and hot. Thank goodness we didn’t break the windshield. We weren’t able to go particularly fast. The Fuso was running pretty hot. It was over 100 degrees outside. We stopped at the entrance to the playa and checked out the signs. We also took a good look at the Fuso to make sure that everything looked ok. It was exceedingly dusty. Carmen went ahead and we followed. Jon and I stopped at Bruno’s Shell and Towing in Gerlach. Carmen had decided to go check on a stuck vehicle. Willie and Gary arrived shortly after we got there. They had decided to go back later in the day for the vehicle. We talked for a short time and we went on our way. A) Come prepared. That means plenty of water and food, recovery gear, a shovel, jack, pull-pal, tow straps/cable, etc. Be sure that you can actually access the recovery gear from the outside of your vehicle. We used to keep the recovery gear in a lower storage box on the passenger side of the vehicle. It is a good thing we moved it, because we really couldn’t reach that box when we sank, plus because of the damage to that box, getting into it would have been exceedingly difficult. C) Pay attention to the weather and find out about the current conditions in the area. The Friends of the Black Rock Desert in Gerlach is a great resource. Things that we didn’t do well. A) Make sure you have actually have roads that reach all the way to your destination. B) Follow well established routes across the playa. C) If you are on a playa, pay very close attention to the surface of the playa. If there is vegetation growing on it, don’t go there. It will be very soft. D) Just because there are tire tracks across an area of the playa doesn’t mean that your vehicle will be able to drive on it, too.